Julia Bristow Fruit Earrings! 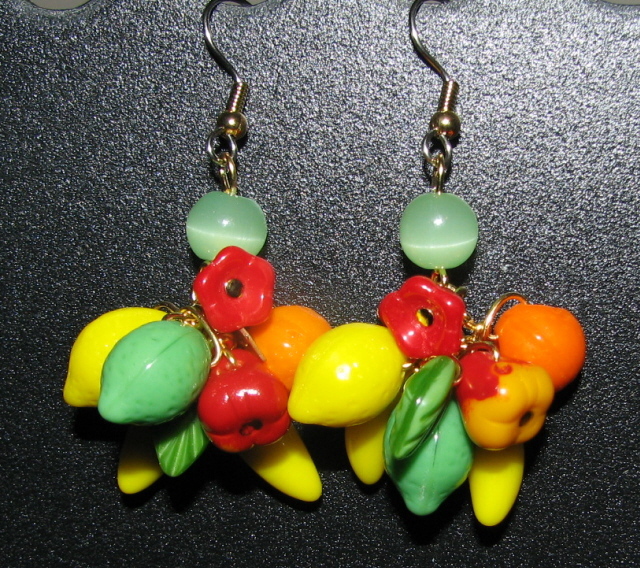 Large bunches of Czech pressed glass fruit beads on each earring: Various mix of oranges, bananas, pears, limes, lemons, cherries, flower, with light green round serpentine gemstone bead on each earring, gold plated findings, and one gold-filled tag signed Julia Bristow, surgical steel posts with gold plated ball. Each measures two inches from top of ear wire to bottom of fruit. (Please note item shown is example and your earrings will vary slightly as each is a one-of-a-kind creation made at time of order.) Please allow two to four weeks for delivery.